I was in the metro the other day. 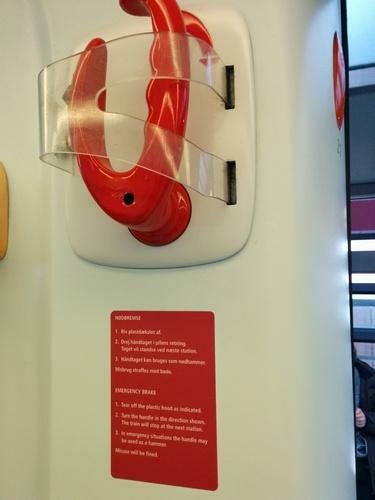 As is the custom in all public transport, there was an emergency brake hidden in plain sight. Which is to say, not hidden at all. Nice composition. Good lighting effects. A pretty standard emergency brake deal, right? No, not that. That’s just Danish alphabet. How judgmental of you! Isn’t it a bit…man, you still haven’t seen it, have you? The train will stop at the next station?! So let me get this straight: When I pull this emergency brake, it just gently reminds the train to please stop at the next station? 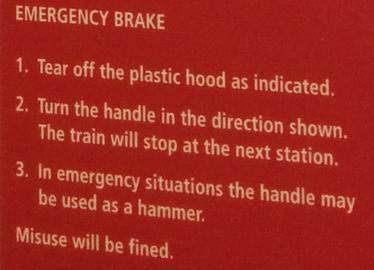 It’s a goddamn emergency brake. Shouldn’t it stop the moment you pull it? Nobody ever calls 911 to have a leisurely chat about when it would be most convenient for the next available police officer to pay a visit to their house and deal with the pesky “homicidal maniac” situation. Do they? I would sort of understand the logic behind this brake if it were placed in an express train that skips a bunch of stations. But here’s the deal: The Copenhagen metro already stops at every single station. And these stations are no more than 2 minutes apart. What’s your agenda here, Metro? Oh! Oooooh! I see what this is. You’re just hoping someone mistakes it for an emergency hammer and starts to assemble their IKEA furniture directly in the train, don’t you? That’s when your staff shows up and “fines” them for “misuse,” right? Nice little racket you’ve got going on there, Metro. Bet you didn’t expect me to crack the puzzle so quickly. I’m on to you! I’ll be watching you from now on, with your fake “emergency brakes” and your oppressive “public decency” rules. On second thought…I may be reading a bit too much into this. It’s probably a perfectly normal emergency brake that’s just learned to slow down and enjoy life. Maybe we can all learn a thing or two from it. I’m confused as to how it’s a hammer AND a break at the same time…….. Isn’t it attached to something? Is it on a superlong bungee cord or something that snaps it back in place after you’re done smashing the window or whatever? 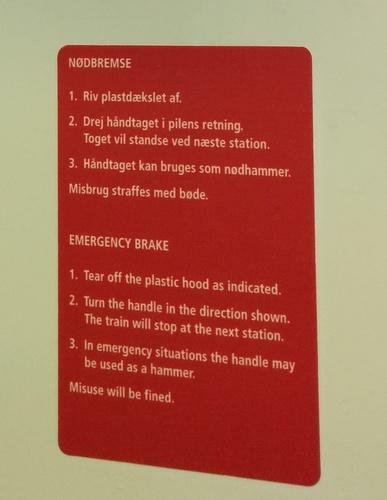 Really hope you’re never in a Danish train during an emergency! I think I may have seen that in a movie once. Some signs can be baffling. On a recent holiday in Mexico, there was a sign adjacent to the path through the hotel complex that read, ‘Please don’t walk on the grass’. Next to it was the outline of a man sprinting. So the message I took away was that walking on the grass is prohibited but it’s ok to run on it! Well, if you run on grass, you touch it a lot fewer times, so it makes sense, doesn’t it? Does it? I don’t know anything anymore. It’s funny cuz it’s true! Glad you liked the post. I too love your blog tweaks! Great before, great now. See how easy I am to please? But they didn’t see Daniel Nest coming did they? Did they???? I do like your “placebo” theory. Why make a functioning device when you can replace it with a fake lever that gives people a false sense of control?! The placebo theory makes perfect sense! Seriously. You know that most “close door” buttons on elevators don’t actually do anything, right? No. That can’t be. No. What next?! Santa isn’t real? I wasn’t really found inside a cabbage patch?! By the way, I love the logo change. The red color really pops out. Forgive me if it’s been there a while. I tend to be a laggard in noticing these things. You dare me, eh? That’s exactly what I’m gonna tell the cops when they’re arresting me tomorrow. This is on you! And thanks…I did quite a few tweaks, including the front page and switching over to an orange theme (all links are orange, etc.). It’s just a mid-blog crisis, probably.